The Gemini Frontier Fields campaign targets three of the Frontier Fields with GeMS/GSAOI. 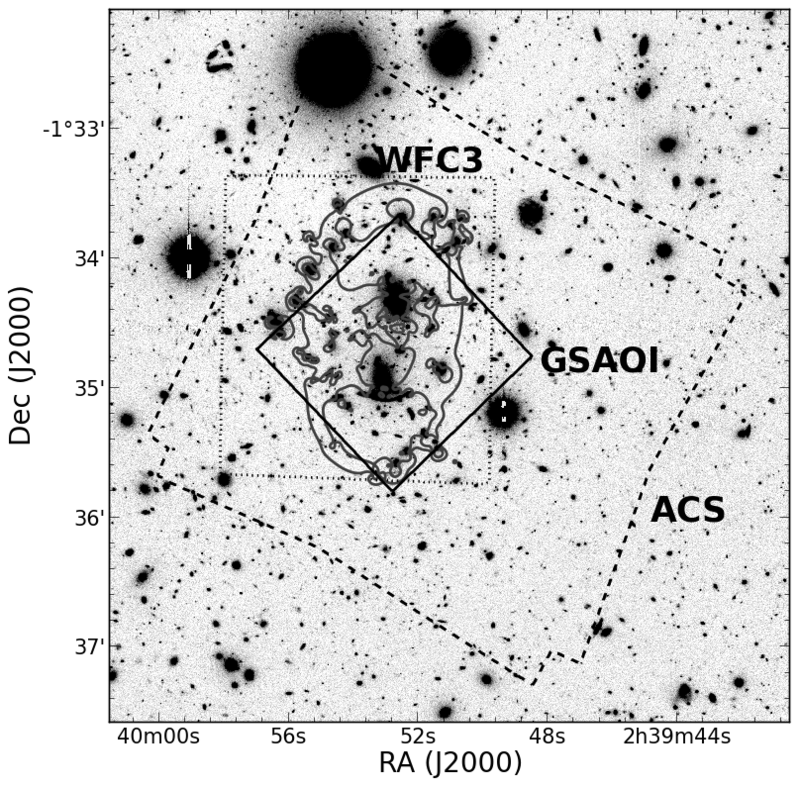 We obtain high-resolution Ks-band imaging with an exposure time of about 5.2h per cluster, complementing the HST/WFC3 data redwards of their 1.7μm cut-off. Given the scarcity of natural guide stars, both PSF FWHM and variations increase with growing angular separation from the guide star. 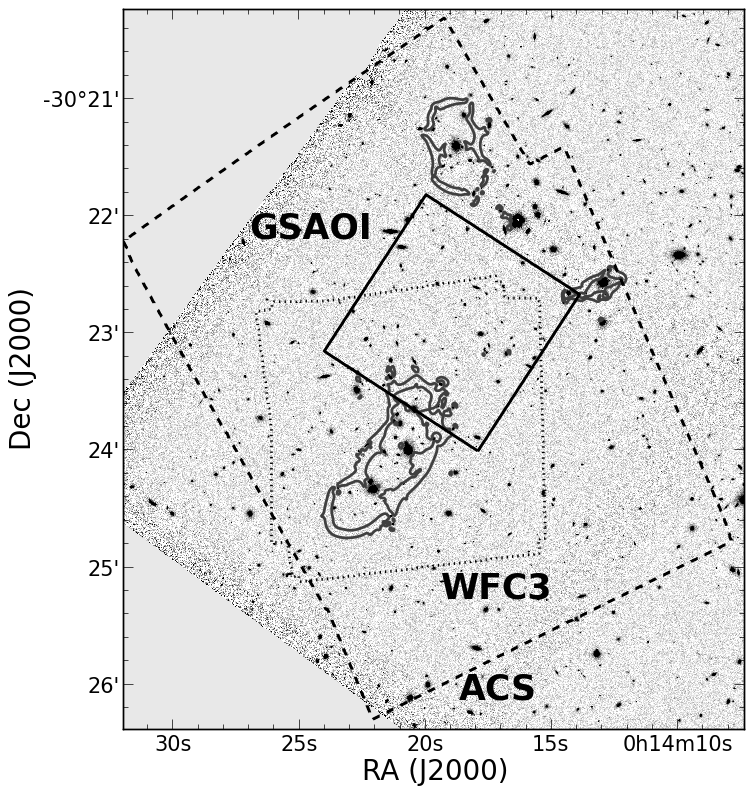 The average GSAOI FWHM is about twice as high as HST/WFC3's in its F160W (H-band) filter. The GSAOI field of view of the final data product is roughly 100"x100", smaller than the HST coverage. The pointing depends on the position of the natural guide star. We intend to overlap as much as possible with the areas where high magnification from strong lensing is expected. This is easily feasible for e.g. Abell 370 and MACS J0416.1-2403, but not for Abell 2744. The 5σ image depth is around 23.8 mag (VEGA based) in Ks-band for compact (yet extended) sources. Different coadditions of the data are provided, matching the GSAOI pixel scale of 0.02"/pix as well as the pixel scales (and WCS projections) of the HST data releases at 0.03"/pix and 0.06"/pix, respectively. Acknowledgment: Please cite Schirmer et al. (2014) in your scientific publication should you make use of the coadded images. 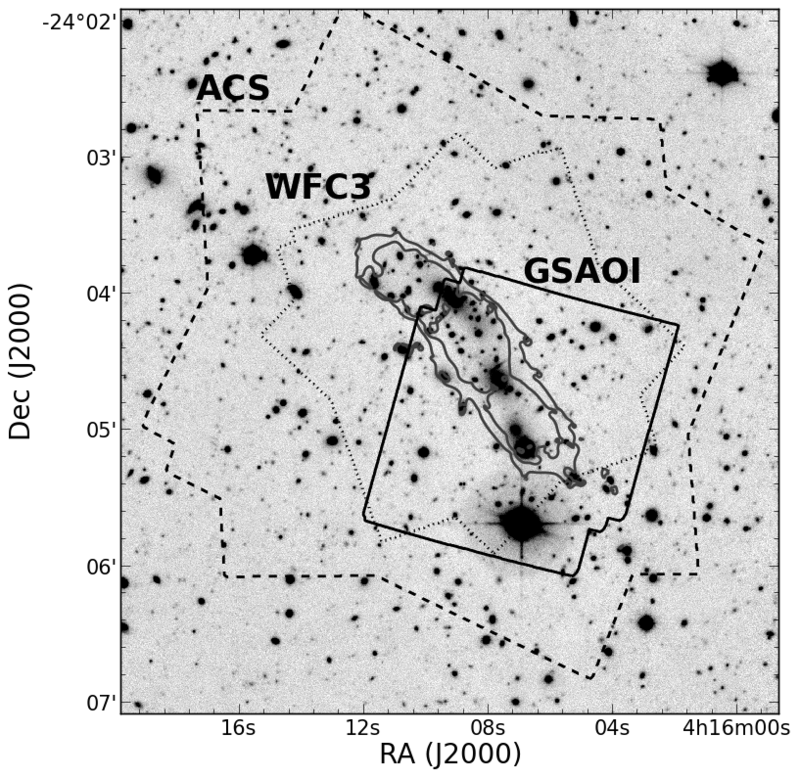 The maps shown below outline the ACS, WFC and GSAOI fields of view, together with regions of high magnification (>20) for sources at redshift 9, as calculated by (Richard et al., 2014). Average image seeing: 0.077" - 0.085"
Average image seeing: 0.110" - 0.150"
The final GSAOI pointing has not yet been chosen.